Thought-provoking quotes and excerpts from the highly influential non-fiction science book/tv-series Cosmos by Carl Sagan. 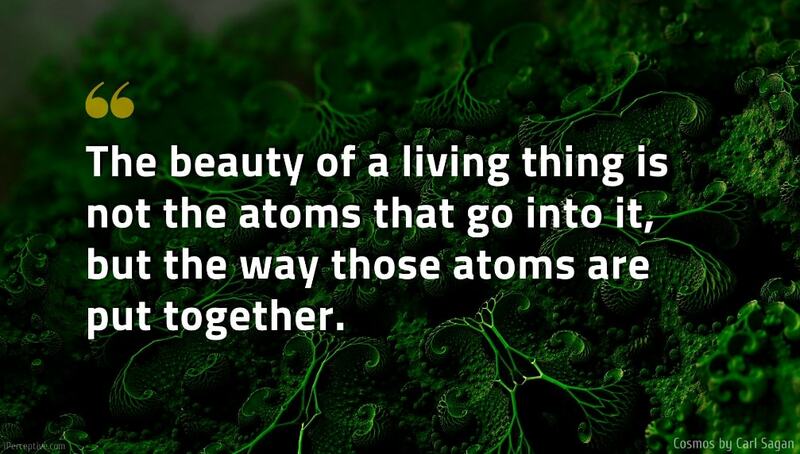 Atoms are mainly empty space. Matter is composed chiefly of nothing. If we ruin the earth, there is no place else to go. 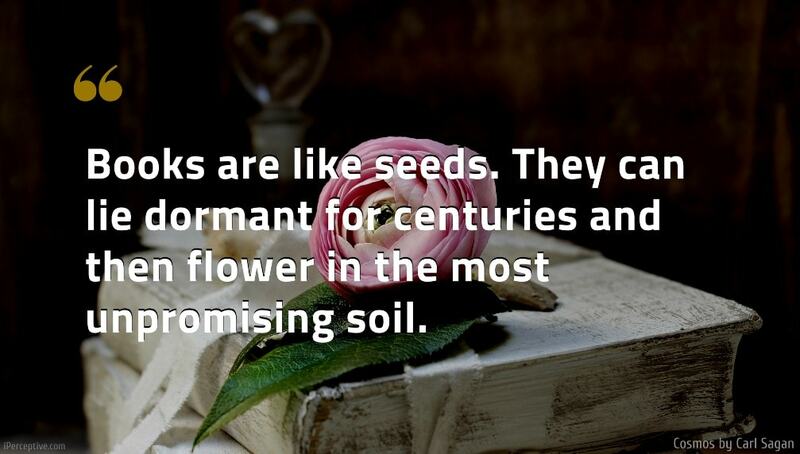 If I finish a book a week, I will read only a few thousand books in my lifetime, about a tenth of a percent of the contents of the greatest libraries of our time. The trick is to know which books to read. 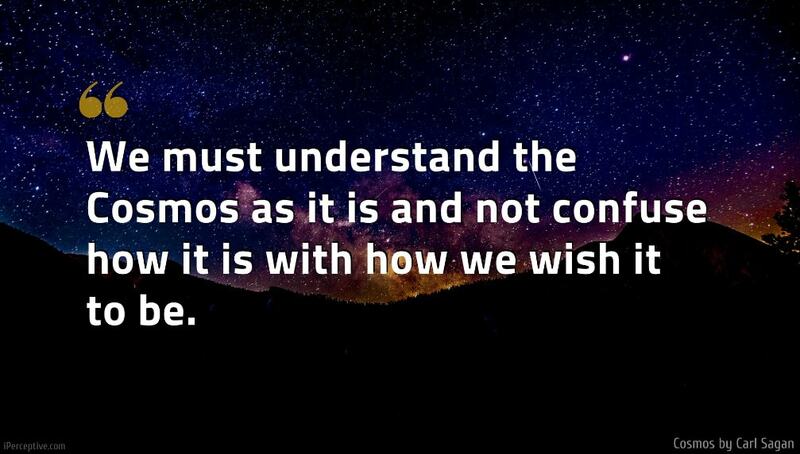 We must understand the Cosmos as it is and not confuse how it is with how we wish it to be. Meanwhile the Cosmos is rich beyond measure: the total number of stars in the universe is greater than all the grains of sand on all the beaches of the planet Earth. Science is an ongoing process. It never ends. 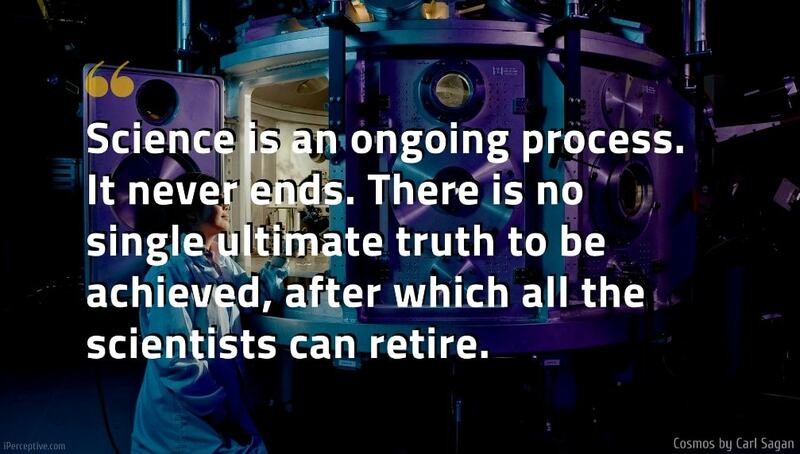 There is no single ultimate truth to be achieved, after which all the scientists can retire. Science needs the light of free expression to flourish. It depends on the fearless questioning of authority, and the open exchange of ideas. There are many hypotheses in science that are wrong. That's perfectly alright; it's the aperture to finding out what's right. Science is a self-correcting process. To be accepted, new ideas must survive the most rigorous standards of evidence and scrutiny. Exploration is in our nature. We began as wanderers, and we are wanderers still. We have lingered long enough on the shores of the cosmic ocean. 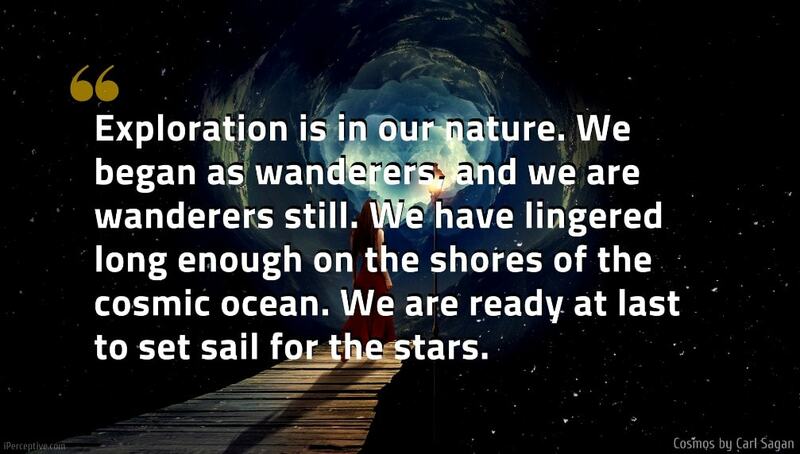 We are ready at last to set sail for the stars. By looking far out into space we are also looking far back into time, back toward the horizon of the universe, back toward the epoch of the Big Bang. Knowing a great deal is not the same as being smart; intelligence is not information alone but also judgement, the manner in which information is coordinated and used. 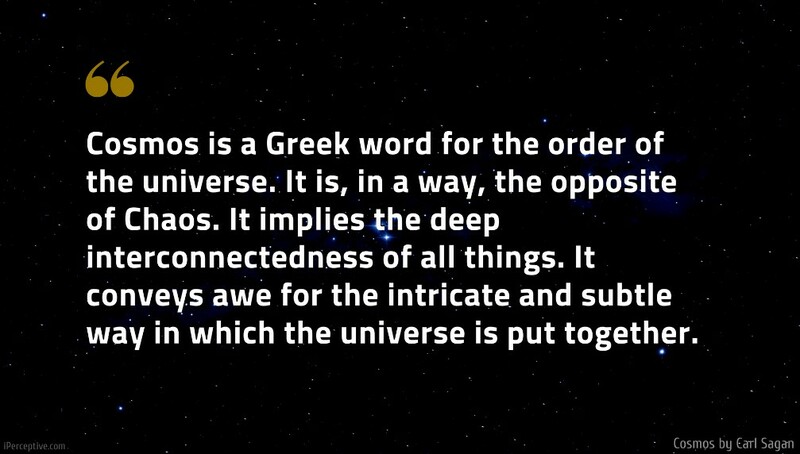 The Greek religion explained that diffuse band of light in the night sky as the milk of Hera, squirted from her breast across the heavens, a legend that is the origin of the phrase Westerners still use—the Milky Way. The lifetime of a human being is measured by decades, the lifetime of the Sun is a hundred million times longer. 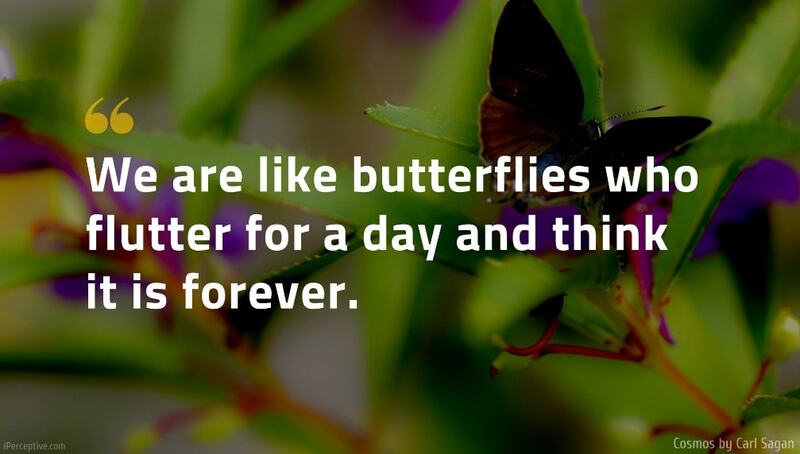 Compared to a star, we are like mayflies, fleeting ephemeral creatures who live out their lives in the course of a single day. The study of the galaxies reveals a universal order and beauty. It also shows us chaotic violence on a scale hitherto undreamed of. That we live in a universe which permits life is remarkable. That we live in one which destroys galaxies and stars and worlds is also remarkable. The universe seems neither benign nor hostile, merely indifferent to the concerns of such puny creatures as we. Every aspect of Nature reveals a deep mystery and touches our sense of wonder and awe. Those afraid of the universe as it really is, those who pretend to nonexistent knowledge and envision a Cosmos centered on human beings will prefer the fleeting comforts of superstition. They avoid rather than confront the world. 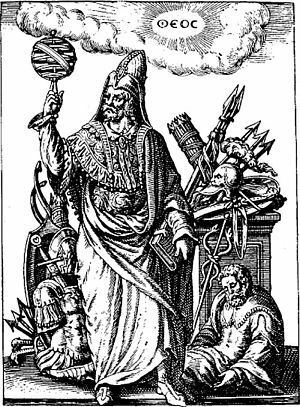 But those with the courage to explore the weave and structure of the Cosmos, even where it differs profoundly from their wishes and prejudices, will penetrate its deepest mysteries. All my life I have wondered about the possibility of life elsewhere. What would it be like? Of what would it be made? All living things on our planet are constructed of organic molecules—complex microscopic architectures in which the carbon atom plays a central role. There was once a time before life, when the Earth was barren and utterly desolate. Our world is now overflowing with life. How did it come about? How, in the absence of life, were carbon-based organic molecules made? How did the first living things arise? How did life evolve to produce beings as elaborate and complex as we, able to explore the mystery of our own origins? And on the countless other planets that may circle other suns, is there life also? Is extraterrestrial life, if it exists, based on the same organic molecules as life on Earth? Do the beings of other worlds look much like life on Earth? Or are they stunningly different—other adaptations to other environments? What else is possible? The nature of life on Earth and the search for life elsewhere are two sides of the same question—the search for who we are. In the great dark between the stars there are clouds of gas and dust and organic matter. Dozens of different kinds of organic molecules have been found there by radio telescopes. The abundance of these molecules suggests that the stuff of life is everywhere. Perhaps the origin and evolution of life is, given enough time, a cosmic inevitability. On some of the billions of planets in the Milky Way Galaxy, life may never arise. On others, it may arise and die out, or never evolve beyond its simplest forms. And on some small fraction of worlds there may develop intelligences and civilizations more advanced than our own. Occasionally someone remarks on what a lucky coincidence it is that the Earth is perfectly suitable for life—moderate temperatures, liquid water, oxygen atmosphere, and so on. But this is, at least in part, a confusion of cause and effect. We earthlings are supremely well adapted to the environment of the Earth because we grew up here. Those earlier forms of life that were not well adapted died. We are descended from the organisms that did well. Organisms that evolve on a quite different world will doubtless sing its praises too. All life on Earth is closely related. We have a common organic chemistry and a common evolutionary heritage. As a result, our biologists are profoundly limited. They study only a single kind of biology, one lonely theme in the music of life. Is this faint and reedy tune the only voice for thousands of light-years? Or is there a kind of cosmic fugue, with themes and counterpoints, dissonances and harmonies, a billion different voices playing the life music of the Galaxy? 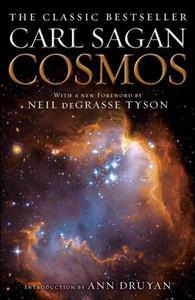 Cosmos is a popular science book written by the astrophysicist and author Carl Sagan. The book dives deep into the history and nature of the universe that we're living in.